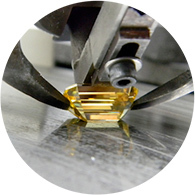 The diamond polishing course from AIDC shows how to identify crystal symmetry, axis and how diamond crystals form before learning the differences in brilliance as a result of proportions and the qualities required for a well cut diamond. The director of the school is an expert in cutting crown facets, how to measure a table for percentage size as well as how to make all main crowns into a perfect square of 90 degrees. Students will also learn how to create a critical angle for both crown and pavilion in order to maximize brilliance along with how to make a culet. All of this is done using modern cutting and polishing diamond equipment such as the sawing machine, the bruting machine and a diamond polishing wheel.